They migrated to paradise: painted photos animate stories of four families – J.
San Francisco artist Heidi Hardin had serious problems with her family when she was growing up in Oklahoma in the ’50s and ’60s. So as soon as she graduated high school, she moved to California — where she discovered art. And for several decades now, art has been a means to connect with community and to reinvent, and celebrate, the true meaning of family. Hardin’s work has been exhibited regularly since 1979, the year she graduated with a master of fine arts in painting from UC San Diego. For many years, she taught painting to children in San Francisco’s Bayview neighborhood, using the unifying project of mural-making to build awareness of environmental issues in the area of the Hunter’s Point Shipyard. There has always been a visionary thread running through her work, one that expresses a fundamental love of humanity and a longing for a better world. 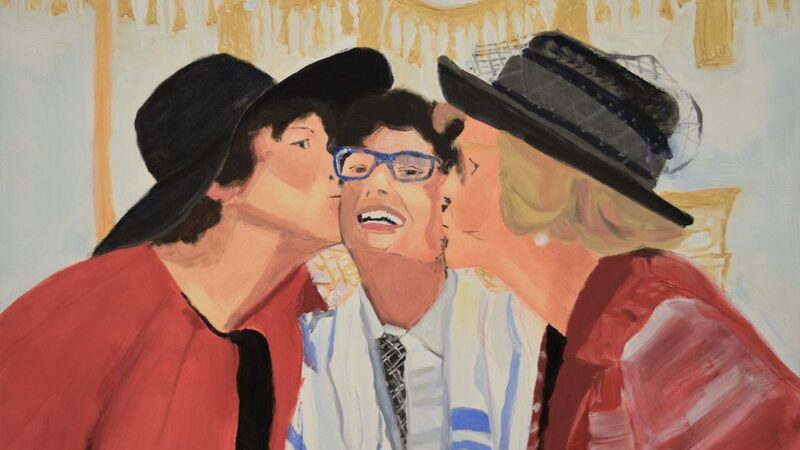 Now her portraits of four local Jewish families are the centerpiece of an exhibit that seeks to illustrate some of the universal experiences of all humanity, regardless of faith, such as love, relationships and constant migration. Sixteen years in the making, Hardin’s “Families in Paradise (The Four Jews)” comprises 78 color portraits of family members who have, over the generations, moved to the United States to start a new life. On view through Dec. 29 at Think Round Fine Arts in the Fillmore District, the installation is the second part of Hardin’s extended project, “The Human Family Tree/A Walk through Paradise.” It envisions multiple exhibits with portraits centering on families who follow one of the world’s seven major religions. Her first exhibit, featuring portraits of two Jewish and two Muslim families, was at SOMArts Gallery in San Francisco in 2004. In the current show, each family is represented by about 20 portraits that Hardin painted from family photographs; many are multigenerational group portraits. The paintings are arranged in mandala-like clusters on freestanding pedestals, such that wherever viewers stand, they can look in different directions and see connections between children, parents, grandparents and other relatives (a “map” is provided to make things easier). The 2-month-old show is complemented by a number of works from Bay Area collage artist Rachel Leibman’s diaspora series. Below each of her paintings, Hardin has curated a collection of objects that evoke the person portrayed, adding a sense of intimacy. And at some stations, visitors can pick up a headset and listen to a soundscape relating to the painting, one composed by the Los Angeles composer and music arranger Jonathan Sacks, Hardin’s longtime collaborator. Sacks’ family is one of the four featured in the exhibit. Jonathan’s father and mother, Irving and Irene, were the Brooklyn-born children of Eastern European immigrants. Advancing economically through education, both had careers in the sciences, and together had three children. The Pestrongs are also featured in the exhibit. One member of that family is Ray Pestrong, a geology professor at San Francisco State whose mother emigrated from Romania and whose father was a boxer from Poland. The Attia family has a Sephardic background. Marc Attia is a Bay Area tech entrepreneur who was born in southeastern France to an Algerian Jewish family. The fourth family is a fascinating study in migration and blended identities over several generations. It’s the Spong-Fernandez family, a clan with an interesting and complex history. It begins with Sephardic Jews who fled the Spanish and Portuguese Inquisition for the Netherlands and then headed to the New World, and continues with marriages to Native Americans and free people of color in the South. Branches of the family migrated into the Southeast, Texas and Appalachia. Hardin has no doubt that it does. “These installations explore ideas about cultural self-definition, the pervasiveness of the American dream, the universality of, and new directions imagined for, the human family and their faiths,” she said of the current show and her extended “Paradise” project. 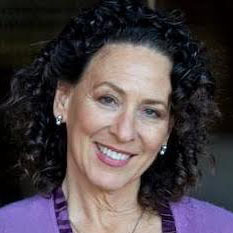 Hardin’s personal journey and growth in the arts led her to form the nonprofit Think Round Fine Arts, which recently was accepted into the United Religions Initiative as a Cooperation Circle. Various circles around the U.S. allow people of different backgrounds the opportunity to work together and tackle community and global issues. The public can see “Families in Paradise (The Four Jews)” during the gallery’s open hours from 9 a.m. to noon on Tuesdays and Thursdays, or by appointment. In addition, Hardin leads walk-throughs on Sundays from 4 to 5 p.m. and school tours on Fridays. And on Saturdays from now until Dec. 29, she is offering free family art-making workshops, talks by Jews about their immigration experiences and other activities. All events are free, but space is limited, so call (415) 602-9599 or email heidi@heidihardin.com to RSVP. “Families in Paradise (The Four Jews).” Through Dec. 29 at Think Round Fine Arts, 2140 Bush St., Suite 1B, S.F. Entrance at driveway. Free. For hours and programs, visit thinkround.org.